Some large shrubs are also considered smaller trees. This article contains eight flowering shrubs that thrive in north, central, and south Florida. These are some of my favorites, and I’ll tell you why. 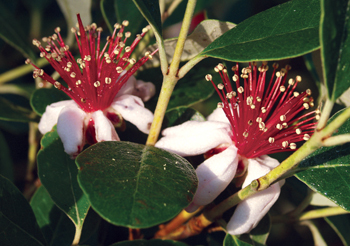 Pineapple guava, Feijoa—Acca sellowiana—this plant can reach a height and spread of 8–15 feet. It prefers slightly acidic to slightly alkaline soil pH, 6.0–7.2, performs best in sandy clay soil and well-drained soil moisture. It has high-drought and low-to-no salt tolerance. Full sun is preferred and partial sun/shade works also. Red/white spring flowers precede the fruits. The flowers are edible and very tasty. Pineapple guava provides food, cover, and nesting for wildlife. Sweet almond bush—Aloysia virgata—this shrub/tree can reach a height and spread of 6–12 feet. It tolerates any soil pH from 4.5–8.0. Any soil texture is acceptable; from clay loam to sandy loam, from sandy to sandy clay. Sweet almond bush performs best in medium-drained soil moisture. It has high-drought tolerance and prefers full sun. This is an evergreen shrub that produces white, fragrant summer through fall flowers. It is so beautiful, we have two at our office, and I have two at home. Pollinators love this plant. Yesterday-today-and-tomorrow—Brunfelsia grandiflora—this plant can reach a height of 7–10 feet and spread of 5–8 feet. It prefers slightly-acidic to slightly-alkaline soil pH, 6.0–7.2. Any soil texture is acceptable; from clay loam to sandy loam, from sandy to sandy clay. Soil moisture should be well drained. It has medium-drought and low-to-no salt tolerance. Full sun is preferred and partial sun/shade and full shade are acceptable. This shrub produces white/lavender/purple flowers from spring through fall. American Beautyberry—Callicarpa Americana—this shrub can reach a height and spread of 6–8 feet. It prefers soil pH that is acidic to slightly alkaline, 4.5–7.2. Any soil texture is acceptable; from clay loam to sandy loam, from sandy to sandy clay. Soil moisture should be well drained. It has high-drought and low-to-no salt tolerance. Partial sun/shade is best and full shade is acceptable. This shrub produces purple/light purple flowers from spring through fall. The fruits provide food for wildlife in late winter. It is deciduous. Bottlebrush—Callistemon spp.—this shrub can reach a height of 6–30 feet and spread of 6–15 feet. It prefers soil pH that is slightly acidic to slightly alkaline, 6.0–7.2. Sandy loam soil texture is best. Soil moisture should be well drained. It has high-drought and medium-salt tolerance. Full sun is best and partial sun/shade is acceptable. This shrub produces red flowers from spring through summer. Bottlebrush has medium- to low-wind resistance. It attracts beneficial insects and birds. Yaupon holly—Ilex vomitoria and cvs.—this shrub can reach a height of 15–30 feet and spread of 6–20 feet. It prefers soil pH that is acidic to slightly alkaline, 4.5–7.2. Any soil texture is acceptable; from clay loam to sandy loam, from sandy to sandy clay. Soil moisture can be well drained to wet. It has high-drought and salt tolerance. Partial sun/shade is best and full sun is acceptable. This shrub produces white flowers from spring through summer. The red fruits provide food for wildlife in late fall-winter. 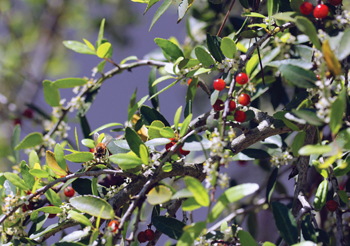 Yaupon holly attracts butterflies and birds. It has high-wind resistance, but is flammable, so in wildfire-prone areas, plant a minimum of 30 feet from buildings. Walter’s viburnum—Viburnum obovatum and cvs.—this shrub can reach a height of 8–25 feet and spread of 6–10 feet. It tolerates any soil pH, from 4.5–8.0. Any soil texture is acceptable; from clay loam to sandy loam, from sandy to sandy clay. Soil moisture should be well drained. It has high-drought and low-to-no salt tolerance. Partial sun/shade is best, while full shade and full sun are acceptable. This shrub produces white flowers from winter through spring. Small, black fruits provide food for wildlife (birds) and nesting cover. Chaste tree—Vitex agnus-castus—this shrub can reach a height of 10–20 feet and a spread of 15–20 feet. It prefers soil pH that is slightly acidic to slightly alkaline, 6.0–7.2. Any soil texture is acceptable; from clay loam to sandy loam, from sandy to sandy clay. Soil moisture should be well drained. It has high-drought and medium-salt tolerance. Full sun is best and partial sun/shade and full shade are acceptable. This shrub produces purple/light purple summer flowers, which provide food for wildlife (butterflies and hummingbirds). It is a deciduous, multi-stemmed shrub. The information in this article is from The Florida-Friendly Landscaping™ Guide to Plant Selection & Landscape Design, which you can view at: fyn.ifas.ufl.edu/pdf/FYN_Plant_Selection_Guide_v090110.pdf. As always, follow the landscape or architectural control procedures in your deed restrictions before making changes. 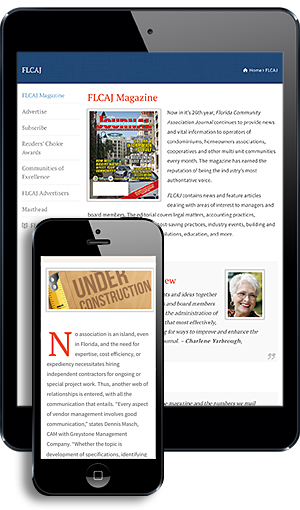 For more information about the nine principles of the Florida-Friendly LandscapingTM Program or for assistance with gardening related questions, contact your local county UF/IFAS Extension and/or visit the University of Florida websites: solutionsforyourlife.com and edis.ifas.ufl.edu.